This is the first in a three-part video series featuring David Blanchett, PhD, CFA, CFP., head of retirement research at Morningstar. David sets the scene for a fascinating discussion about the ‘grand puzzle’ as he calls it. In other words, how to come up with successful withdrawal strategies for UK retirees. At the heart of any withdrawal strategy is the quest to find how much retirement will actually cost, and how to cover that cost without running out of money. How long are you going to live for? How much money will you spend each year? What investment return and inflation will be over the period? And herein lies the challenge - and the very essence - of retirement income planning! Working with clients to define their number and better understand what these questions mean. This presentation was delivered at the Science of Retirement Conference 2018. 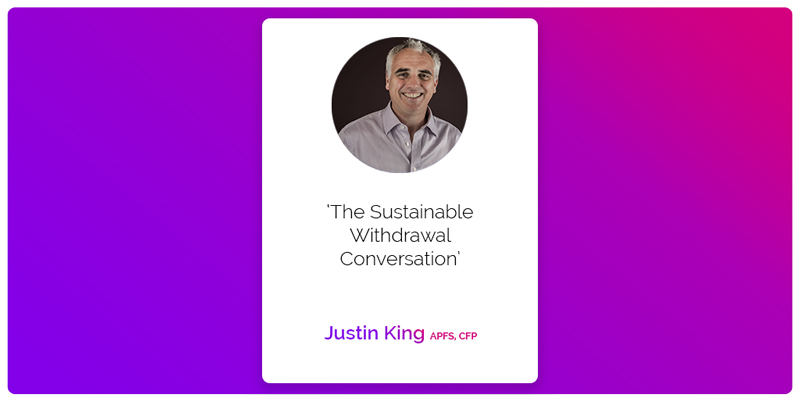 Check out our previous series by financial planner Justin King APFS, CFP on how he works with clients to figure how their sustainable withdrawal strategy.